Ffestiniog Travel are delighted to offer you the chance to sample a slice of Ireland's great railway heritage on a 4-night mini-break in association with Iarnród Éireann Irish Rail, the State-owned rail system in Ireland. As part of the country's year-long 'Gathering' celebrations you have the chance to discover its long and rich railway history, from architecture to historic vehicles and locomotives. Compare this with their modern fleet and frequent services to experience the country's great railway tradition. Based in Dublin for four nights the package includes a rail journey to Cobh in the West of Ireland, where the Titanic made her last, fateful port call in 1912. Visit the Cobh Heritage Centre and see and hear the tales of voices long gone, the tide of emigration in famine times and the transatlantic role of the famous Cunard and White Star liners - you may see one of the huge cruise ships which call regularly at Cobh. On Day 2 travel north by rail to Belfast and on to Cultra, home of the Ulster Transport Museum, a living museum which houses horse drawn carriages, electric trams, boats, motorbikes, fire-engines and vintage cars. To Waterford by train on Day 3 for a ride on the Waterford & Suir Valley Railway, a majestic journey that winds its way through lovely scenery on narrow-gauge track. 2013 is certainly the year to visit Ireland as the country opens its arms to friends and family from all over the world, inviting them home to locally organised gatherings in villages, towns and cities throughout the year, visit www.thegatheringireland.com for more information. 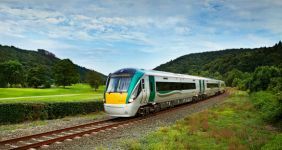 This rail package is Iarnród Éireann Irish Rail's inaugural tour and will focus on Ireland's railway heritage while you travel on and experience Irish Rail's modern fleet and service. It will appeal to the rail enthusiasts among you but also offers a great way of seeing Ireland during this festival year. 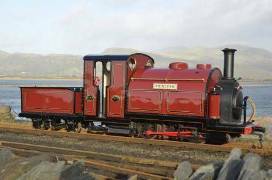 An added bonus is that Ffestiniog Railway's very own original steam locomotive 'Princess' will be on display at Dublin's Heuston Station for a period of time during May and June as part of the FR’s 150 years of steam celebrations. The 4-night mini-break, with prices starting at £355pp, is a tailor-made package and departures are daily during May and June 2013 (subject to availability). Your stay in Ireland can be extended beyond the recommended five days. Ffestiniog Travel can arrange onward transportation and accommodation. So to be part of Ireland's massive 2013 'Gathering' visit our website for more information or contact David Bagguley at david.bagguley@ffestiniogtravel.co.uk direct or call 01766 772030.